Newmont is proposing to acquire all the shares of Goldcorp pursuant to an Ontario Plan of Arrangement for consideration consisting of 0.3280 of a Newmont Share and US$0.02 in cash for each Goldcorp Share. 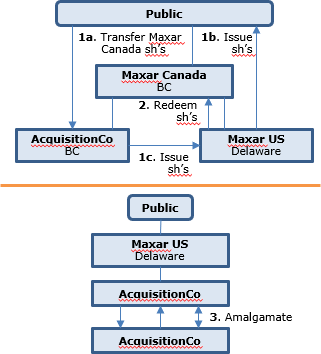 This would be a direct acquisition, i.e., no Canadian Buyco, and no use of exchangeable shares. 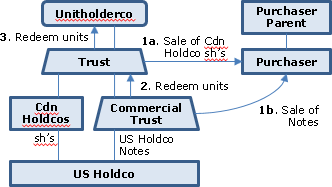 The acquisition would occur on a non-rollover basis for U.S. purposes, i.e., the cash boot is considered to be sufficient to “bust” the IRC s. 351 rollover. Prior to the s. 86 distribution of cash by Thomson Reuters described in a previous post, it made an issuer bid to purchase up to U.S.$9 billion of its shares for cash under a modified Dutch auction procedure. 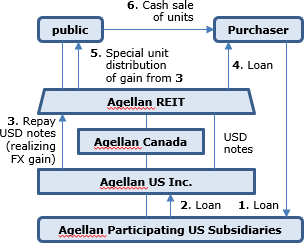 In fact, U.S.$6.5 billion in shares was tendered. Leaving aside s. 55(2), over ¾ of the purchase price was deemed to be a dividend. On November 27, 2018, Thomson Reuters distributed US$2.3 billion to its shareholders (being a portion of the US$17 billion realized earlier in the year on an asset sale), using a s. 86 distribution. 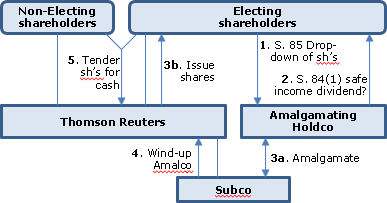 In order to avoid potentially adverse tax consequences for some shareholders in foreign jurisdictions, Thomson Reuters gave non-exempt shareholders in non-Canadian jurisdictions the right to opt out of the cash distribution so that, rather than receiving such cash, their percentage equity interest in the Corporation would increase by an appropriate amount. 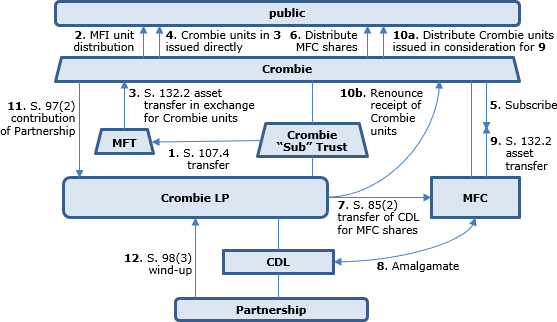 Crombie REIT held the units and notes of a subsidiary unit trust (Crombie Subsidiary Trust), whose principal asset was most of the partnership interests, other than exchangeable LP units held by the Empire group, in a subsidiary LP (“Crombie LP”), which held real estate and a corporate subsidiary (“CDL”).